Magnolia is the common name and genus name for a large group of deciduous or evergreen trees and shrubs in the flowering plant family Magnoliaceae, characterized by aromatic twigs and often large and showy flowers. The term is also used for the flower of any of these plants. Magnolia species are native to the Western Hemisphere (eastern North America, Central America, the West Indies, and some in South America and to east and southeast Asia. 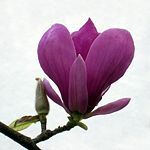 Today, many species of Magnolia and an ever increasing number of hybrids can also be found as ornamental trees in large parts of North America, Europe, Australia, and New Zealand. The often showy white, pink, yellow, and purple flowers of Magnolia species, such as the Southern magnolia (M. grandiflora) with it large blossoms, provide aesthetic value, such as in landscaping. In addition, some species, such as M. officinalis, have a long history of their bark being used medicinally in herbal medicine. Ecologically, magnolias have a symbiotic relationship with beetle pollinators, provide nutrition for beetles, while receiving the benefit of pollination. The Magnolia genus is part of the Magnoliaceae family, in the flowering plant order Magnoliales. Unlike most angiosperms (flowering plants), whose flower parts are in rings, the Magnoliaceae have their stamens and pistils in spirals on a conical receptacle. This arrangement is found in old fossil plants and is believed to be primitive for angiosperms. Magnoliaceae flowers are not so clearly differentiated into having sepals and petals like most other flowering plants. The "dual-purpose" parts that occupy both positions are known as tepals, a term coined for these intermediate or indistinguishable petals and sepals. Tepals range from six to many. The seeds are exposed when the fruit splits open. The inflorescence is a solitary flower. Members of Magnoliaceae generally shared the presence of bisexual flowers, with the exception of Kmeria and some species of Magnolia section Gynopodium. Stamens are numerous and feature short filaments, which are poorly differentiated from the anthers. Carpels are usually numerous, distinct, and on an elongate recepticle. Magnoliaceae flowers are showy and beetle pollinated, except for Liriodendron, which is bee pollinated. The carpals of Magnolia flowers are especially thick to avoid damage by beetles who feast and crawl on them. Leaves of Magnoliaceae species are alternate, simple, and sometimes lobed. The fruit is an aggregate of follicles which usually become closely appressed as they mature and open along the abaxial surface. Seeds have a fleshy coat and color that ranges from red to orange (except Liriodendron). The seeds of Magnolioideae are bird dispersed while the seeds of Liriodendron are wind dispersed. Liriodendroidae, a monogeneric subfamily, of which Liriodendron (Tulip trees) is the only genus. The family has approximately 225 species in 7 genera, although some classification systems include all of subfamily Magnoioideae in genus Magnolia. Magnolia is a large genus of about 210 species, depending on the taxonomic scheme. It is an ancient genus. Having evolved before bees appeared, the flowers developed to encourage pollination by beetles. As a result, the carpels of Magnolia flowers are tough, to avoid damage by eating and crawling beetles. Fossilized specimens of M. acuminata have been found dating to 20 million years ago, and of plants identifiably belonging to the Magnoliaceae dating back to 95 million years ago. Magnolias have long been known and used in China. References to their medicinal qualities go back to as early as 1083 (Treseder 1978, 9). After the Spanish conquest of Mexico, Philip II commissioned his court physician Francisco Hernandez in 1570 to undertake a scientific expedition. Hernandez made numerous descriptions of plants, accompanied by drawings, but publication was delayed and hampered by a number of consecutive accidents. Between 1629 and 1651 the material was re-edited by members of the Academy of Lincei and issued (1651) in three editions as Nova plantarum historia Mexicana. This work contains a drawing of a plant under the vernacular name Eloxochitl, that is almost certainly Magnolia dealbata (= Magnolia macrophylla subsp. dealbata). This appears to have been the first-ever description of a Magnolia that came to the Western World (Treseder 1978, 9-13). It is unclear whether there are early descriptions made by English or French missionaries that were sent to North America but the first introduction of a Magnolia from the New World into Europe is well documented. It was the missionary and plant collector John Bannister (1654-1693) who sent back a plant then called Laurus tulipifera, foliis subtus ex cinereo aut argenteo purpurascentibus (Laurel-leaved tulip tree, with leaves of which the under sides from ash gray or silvery gray turn into purplish) from Virginia in 1688, to Henry Compton, the Bishop of London. This species is now known as Magnolia virginiana (Sweetbay magnolia). Thus, the first Magnolia had already found its way to Europe before Charles Plumier discovered a tree on Martinique to which he would give the name Magnolia (Treseder 1978, 14). In 1703, Charles Plumier (1646-1704) described a flowering tree from the island of Martinique in his Genera (Plumier 1703). He gave the species, known locally as "Talauma," the genus name Magnolia, after Pierre Magnol. The English botanist William Sherard, who studied botany in Paris under Joseph Pitton de Tournefort, a pupil of Magnol, was most probably the first after Plumier to adopt the genus name Magnolia. He was at least responsible for the taxonomic part of Johann Jacob Dillenius's Hortus Elthamensis (1732) and of Mark Catesby's famous Natural History of Carolina (1731). These were the first works after Plumier's Genera that used the name Magnolia, this time for some species of flowering trees from temperate North America. Carolus Linnaeus, who was familiar with Plumier's Genera, adopted the genus name Magnolia in 1735 in his first edition of Systema naturae, without a description but with a reference to Plumier's work. In 1753, he took up Plumier's Magnolia in the first edition of Species plantarum. Since Linnaeus never saw a herbarium specimen (if there has ever been one) of Plumier's Magnolia and had only his description and a rather poor picture at hand, he must have taken it for the same plant that was described by Catesby in his 1731 'Natural History of Carolina, and placed it in the synonymy of Magnolia virginiana variety foetida, the taxon now known as Magnolia grandiflora. The species that Plumier originally named Magnolia was later described as Annona dodecapetala by Lamarck (1786), and has since been named Magnolia plumieri and Talauma plumieri (and still a number of other names) but is now known as Magnolia dodecapetala. (Under the rule of priority, the first name that is validly published in Linnaeus' Species plantarum, May 1, 1753, or any other work of any other botanist after that, takes precedence over later names. Plumier's name was not a binomen and moreover published before Species plantarum, so it has no status. The first binomen that was published after 1753 was Lamarck's Annona dodecapetala (1786). Magnolia plumieri (1788) was published on a later date by Schwartz, and is treated as a later synonym, as are Magnolia fatiscens (Richard 1817), Talauma caerulea (Jaume St-Hilaire 1805) and Magnolia linguifolia (1822). By the end of the eighteenth century, botanists and plant hunters exploring Asia began to name and describe the Magnolia species from China and Japan. The first Asiatic species to be described by western botanists were Magnolia denudata, Magnolia liliiflora, Magnolia coco, and Magnolia figo. Soon after that, in 1794, Carl Peter Thunberg collected and described Magnolia obovata from Japan and, within a close proximity to that period, Magnolia kobus was also first collected. With the number of species increasing, the genus was divided into subgenus Magnolia, and subgenus Yulania. Magnolia contains the American evergreen species Magnolia grandiflora, which is of horticultural importance, especially in the United States, and Magnolia virginiana, the type species. Yulania contains several deciduous Asiatic species, such as Magnolia denudata and Magnolia kobus, which have become horticulturally important in their own right and as parents in hybrids. Classified in Yulania is also the American deciduous Magnolia acuminata (Cucumber tree), which has recently attained greater status as the parent that is responsible for the yellow flower color in many new hybrids. By the end of the twentieth century, DNA sequencing had become available as a method of large scale research on phylogenetic relationships. Several studies, including studies on many species in the family Magnoliaceae, were carried out to investigate relationships (Azuma et al. 1999; Azuma et al. 2001; Kim et al. 2001). What these studies all revealed was that genus Michelia and Magnolia subgenus Yulania were far more closely allied to each other than either one of them was to Magnolia subgenus Magnolia. These phylogenetic studies were supported by morphological data (Figlar 2000). As nomenclature is supposed to reflect relationships, the situation with the species names in Michelia and Magnolia subgenus Yulania was undesirable. Taxonomically, there are three choices: (1) to join Michelia and Yulania species in a common genus, not being Magnolia (for which the name Michelia has priority); (2) to raise subgenus Yulania to generic rank, leaving Michelia names and subgenus Magnolia names untouched; or (3) to join Michelia with genus Magnolia into genus Magnolia s.l. (a big genus). Magnolia subgenus Magnolia can not be renamed because it contains Magnolia virginiana, the type species of the genus and of the family. Not many Michelia species have so far become horticulturally or economically important, apart for their wood. Both subgenus Magnolia and subgenus Yulania include species of major horticultural importance, and a change of name would be very undesirable for many people, especially in the horticultural branch. In Europe, Magnolia even is more or less synonym for Yulania, since most of the cultivated species in this continent have Magnolia (Yulania) denudata as one of their parents. Most taxonomists who acknowledge close relations between Yulania and Michelia therefore support the third option and join Michelia with Magnolia. The same goes, mutatis mutandis, for the (former) genera Talauma and Dugandiodendron, which are then placed in subgenus Magnolia, and genus Manglietia, which could be joined with subgenus Magnolia or may even earn the status of an extra subgenus. Elmerrillia seems to be closely related to Michelia and Yulania, in which case it will most likely be treated in the same way as Michelia is now. The precise nomenclatural status of small or monospecific genera like Kmeria, Parakmeria, Pachylarnax, Manglietiastrum, Aromadendron, Woonyoungia, Alcimandra, Paramichelia, and Tsoongiodendron remains uncertain. Taxonomists who merge Michelia into Magnolia tend to merge these small genera into Magnolia s.l. as well. At present, western botanist tend toward a big Magnolia genus, whereas many Chinese botanists still recognize the different small genera. Note: the following list only includes temperate species; many other species occur in tropical areas. Magnolia subgenus Magnolia: Anthers open by splitting at the front facing the centre of the flower. Deciduous or evergreen. Flowers produced after the leaves. Magnolia subgenus Yulania: Anthers open by splitting at the sides. Deciduous. Flowers mostly produced before leaves (except M. acuminata). Mangolias have been prized for ornamental purposes. Their often showy flowers, such as the Southern magnolia (Magnolia grandiflora) with it large blossoms or others with showy white, pink, yellow, or purple flowers, adds to the aesthetic beauty of a landscape. In general, Magnolia is a genus that has attracted a lot of horticultural interest. Hybridization has been immensely successful in combining the best aspects of different species to give plants that flower at an earlier age than the species themselves, as well as having more impressive flowers. One of the most popular garden magnolias is a hybrid, M. x soulangeana (Saucer magnolia; hybrid M. liliiflora x M. denudata). Originally native to China, M. officinalis also is used now in landscaping around the world, having large leaves surrounding a white, fragrant flower (Davidson and Frey 2005). Magnolias are used as food plants by the larvae of some Lepidoptera species including Giant Leopard Moth. ↑ Under these names, the species were described by Desrousseaux in Lamarck's Encyclopédie Méthodique Botanique, tome troisieme (1792): 675. In the beginning of the twentieth century, descriptions that seemed to represent the same species, were found in a work of the French naturalist P.J. Buc'hoz, Plantes nouvellement découvertes (1779), under the names Lassonia heptapeta and Lassonia quinquepeta. In 1934, the English botanist J.E. Dandy argued that these names had priority over the names by which both species had been known for over a century and hence from then on Magnolia denudata had to be named Magnolia heptapeta, and Magnolia liliiflora should be changed into Magnolia quinquepeta. After a lengthy debate, specialist taxonomists decided that the Buc'hoz names were based on chimaeras (pictures constructed of elements of different species), and as Buc'hoz did not cite or preserve herbarium specimens, his names were ruled not to be acceptable. ↑ These species were published as Liriodendron coco and Liriodendron figo by J. de Loureiro in Flora Cochinchinensis (1790) and later (1817) transferred to Magnolia by A. P. de Candolle. Magnolia figo was soon after transferred to the genus Michelia. ↑ Magnolia kobus only received its name in 1814, when it was validly published by A.P. de Candolle. There has been much confusion about earlier attempts to validly publish this species, especially because descriptions and type specimens did not match. Azuma, H., L. B. Thien, and S. Kawano. 1999. Molecular phylogeny of Magnolia (Magnoliaceae) inferred from cpDNA sequences and evolutionary divergence of the floral scents. Journal of Plant Research 112(1107): 291-306. Azuma, H., J. G. García-Franco, V. Rico-Gray, and L. B. Thien. 2001. Molecular phylogeny of the Magnoliaceae: The biogeography of tropical and temperate disjunctions. American Journal of Botany 88: 2275-2285. Callaway, D. J. 1994. The World of Magnolias. Portland, Oregon: Timber Press. ISBN 0881922366. Catesby, M. 1731. The Natural History of Carolina, Florida, and the Bahama Islands, volume 1. London. Davidson, T., and R. J. Frey. 2005. Magnolia. In J. L. Longe, The Gale Encyclopedia of Alternative Medicine. Farmington Hills, Mich: Thomson/Gale. ISBN 0787693960. Dillenius, J. J. 1732. Hortus Elthamensis, Seu Plantarum Rariorum Quas in Horto suo Elthami in Cantio Coluit vir Ornamentissimus et Praestantissimus Jacobus Sherard. London [The garden of Eltham, or rather about the rare plants that the most distinguished and prominent man Jacob Sherard grows in his garden in Eltham in Kent]. Figlar, R. B. 2000. Proleptic branch initiation in Michelia and Magnolia subgenus Yulania provides basis for combinations in subfamily Magnolioideae. In Liu Yu-hu et al., Proceedings of the International Symposium on the Family Magnoliaceae: 14-25, Science Press, Beijing. Guangson Pharmaceutical (GSP). 2007. Magnolia bark extract. Guangson Pharmaceutical. Retrieved November 21, 2007. Hunt, D. (ed). 1998. Magnolias and Their Allies. International Dendrology Society & Magnolia Society. ISBN 0951723480. Kim, S. et al. 2001. Phylogenetic relationships in family Magnoliaceae inferred from ndhF sequences. American Journal of Botany 88(4): 717-728. Lamarck, J. B. P. A. de. 1786. Encyclopédie Méthodique Botanique, 2nd edition. Paris. Liu, Y. H. 2004. Magnolias of China. Hong-Kong, Beijing Science & Technology Press. ISBN 7530427652. Plumier, C. 1703. Nova Plantarum Americanarum genera. Paris. [New genera of American plants]. Supplement Watch (SW). 2007. Magnolia bark. Supplmentwatch.com. Retrieved November 21, 2007. Treseder, N. G. 1978. Magnolias. London/Boston: Faber & Faber. ISBN 0571096190. Magnolias Threatened by Logging, Development from National Public Radio. Selecting Trees for your Home - Magnolia Trees University of Illinois Extension. This page was last modified on 7 August 2018, at 18:13.